The strawberries put up in 2018 are so sweet that they do not need anything added to them. They were at the peak of ripeness when picked and processed on the same day! This is a perfect Valentines Day treat with its bright red strawberries! This made a 4 serving dish in a regular glass pie plate.. Feel free to double the amount if you want to make a larger pan. *the strawberries had been frozen and then thawed out and so they drained nicely, if you are using fresh strawberries, I would recommend sprinkling 1 tsp of flour per 4 four cups of strawberries of the fresh ones to help thicken the juice a touch as it cooks. Can be served hot or cold, can be served as is or you could put a tiny scoop of Vanilla or strawberry ice cream. Or you could put a small dollop of whipped cream. 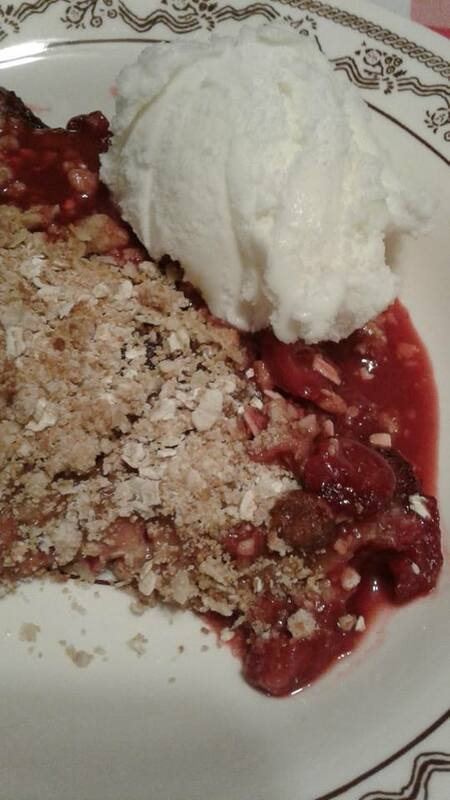 This entry was posted in Baking and tagged Homemade Strawberry Crumble, How to make a strawberry crumble, How to use frozen strawberries, Red Dessets for Valentines Day, Strawberry Crisp, Strawberry Crumble, Valentines Day Dessert. Bookmark the permalink. Crumble is a favourite in Husband’s family! And, more importantly, one of the few dishes I can actually make….. Most often made with foraged apples and blackberries. With it being berries and not stewing the fruit first, how long would you cook this for? I do often stew the fruit first, but because it was soften already and I could drain it after I thawed it in the fridge. I cooked it for 25 min at 350. For me that left the top golden brown and the edges hot and bubbling. I think it might take an extra five or ten min if it was fresh fruit with the sprinkle of flour over it.. Trying to keep calories under control girl.. single is just yummy too.. I love these delicious easy recipe’s! This one is just in time for the Big Game today! Thanks Mary Jean.. enjoy the dessert and the game!